Dr. Cross will have a gentle approach to all aspects of your care. Periodontal disease is a bacterial infection that causes the destruction of the tissues (bone) that support the teeth. The bacterial colonies are referred to as plaque or commonly called tartar. 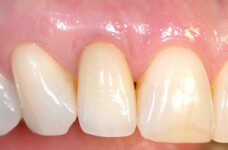 The size of the plaque deposits may range from very small to increasing in size. 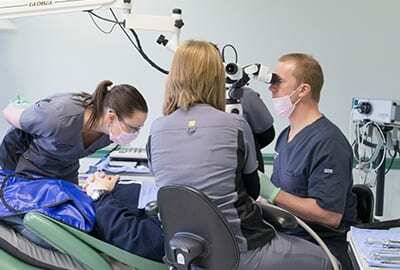 Springfield periodontist Dr. David Cross relies on a high-magnification microscope to provide exceptional detail that removes plaque and tartar with precision and effectiveness. The result is the elimination of pathologic bacteria that promote periodontal disease and prevention of further damage to your soft (gingival) and hard (bone) tissues. Mild: The earliest form of gum disease is the most opportune time to initiate treatment. This allows Dr. Cross to prevent significant damage and loss of the bone that holds the teeth in place. Moderate: As the disease progresses there is further loss of the boney tissues that support the teeth. The bacterial infection becomes increasingly more challenging to properly remove. 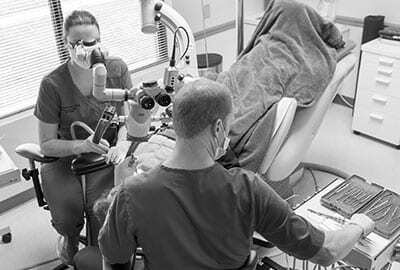 Dr. Cross’ ability in treating gum disease is unparalleled in both precision and effectiveness. Severe: If untreated for a longer period of time, periodontitis can cause the loss of teeth and jawbone, requiring procedures such as bone grafting and dental implants to restore the structure and function of your teeth. Springfield patients benefit from having Dr. Cross and his clinical abilities with unprecedented magnification in the treatment and management of their oral and periodontal health. How Is Periodontal Disease Evaluated? 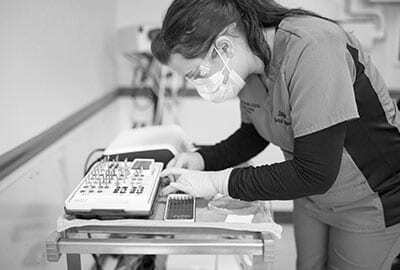 During a periodontal examination, Dr. Cross uses the most sophisticated digital radiography determine the precise degree of periodontal disease and areas that require treatment. By providing patients with a comprehensive oral and periodontal examination, Dr. Cross will develop a treatment plan to protect your teeth and restore your smile. While gum recession is not considered periodontal disease, this still involves the loss and destruction of the soft (gingiva) and hard (bone) tissues that hold the teeth in place. Gum recession may develop as a result of aggressive brushing and flossing, which erodes the natural gum line, jaw bone and exposes the sensitive root. Aside from an additional cosmetic component, gum recession leaves your tooth vulnerable to infection, tooth decay and can eventually lead to tooth loss. What Treatment is Available for Periodontal Disease? 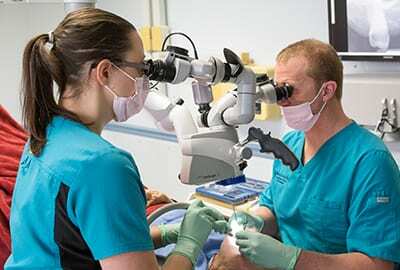 Scaling and Root Planing to carefully remove all plaque and tartar buildup using the high magnification of a microscope for greater detail. Gum graft to restore gum tissue and protect teeth from harmful bacteria. 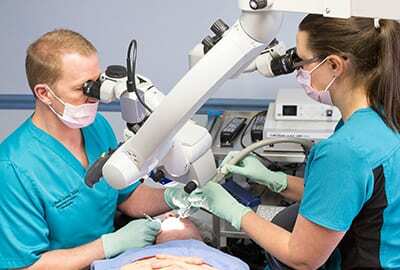 Pinhole surgery to treat gum recession in a way that improves your appearance and protects your teeth. 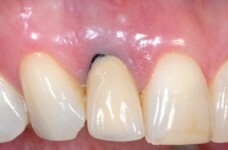 Bone graft for more severe cases where bone has been lost due to periodontitis and infection. 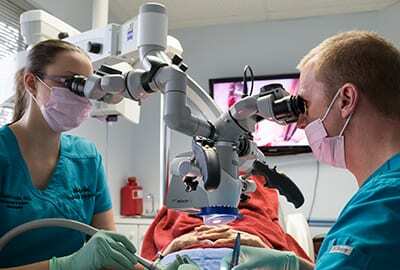 The accuracy of the surgical microscope coupled with Dr. Cross’s gentle techniques reduces healing time and discomfort for even the most invasive procedures. Dr. Cross practice philosophy is conservative and he strives to minimize the invasiveness of his treatment. The recommendation and decision to undergo periodontal surgery is discussed thoroughly with each patient in order that they may make an informed decision. Although these treatment options may sound uncomfortable, Dr. Cross has evolved atraumatic techniques for all of his treatments to maximize patient comfort. Because the surgical microscope allows for high-powered magnification, Dr. Cross is able to provide precise and minimally invasive treatment. If you wish to have an examination or require treatment for periodontal disease, please contact our Springfield office at 217-793-0196.